Heat oven to 350°F (325°F for dark or nonstick pan). Grease bottom of 9-inch square pan with shortening or cooking spray. Make and bake brownies as directed on box. After removing pan from oven, set oven control to broil. 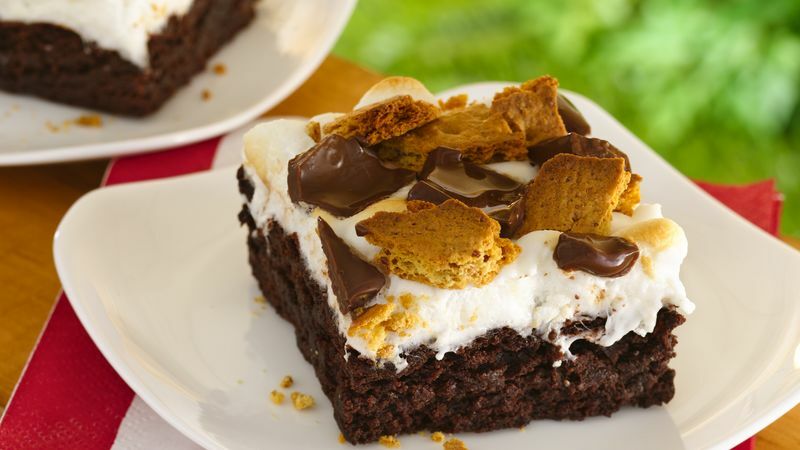 Immediately sprinkle marshmallows and graham crackers over warm brownies. Broil with top 4 to 5 inches from heat 30 to 60 seconds or until marshmallows are golden brown. (Watch carefully; marshmallows and graham crackers will brown quickly.) Sprinkle with candy. Cool on cooling rack, about 3 hours until chocolate is set. Cut into 4 rows by 4 rows. Use a knife dipped in hot water and wiped clean to easily cut brownies. Wrap up brownies individually in waxed paper or foil for picnics or tailgating.